We live in a world obsessed by technology, where gadgets have become a central part of everyday life. Many of us will possess and use a smartphone, laptop and tablet on a regular basis, and with the rise of technology comes the rise of accompanying accessories. Designers and brands have realised the need to keep our electrical items safe, with protective cases, covers and specialist bags now considered as much of a fashion accessory as a new scarf or pair of gloves. So, whether you use your gadgets for business or just leisure, here are some of the best luxury accessories designed to safeguard your essentials in style. A bag that charges your phone on the go? We’re already sold on Aspinal of London’s technical update on its classic Mount Street bag, which comes with an optional charger pack and built in pouches for your smartphone, tablet and laptop. Crisp, stylish and practical, this bag is a modern business essential. Available at Aspinal of London, priced £495, with the optional charger pack available for an additional £100. 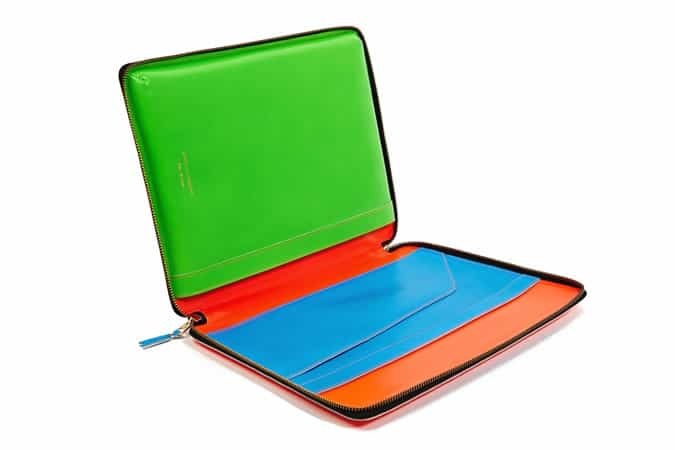 Loud and proud, this iPad case by Japanese label Comme des Garçons serves up luxury tech with a quirky edge. Beyond an eye-catching statement piece, this accessory is spacious enough to hold an iPad, in addition to those all-important documents and cards. The perfect companion to any meeting. Available at Oki-ni, priced £270. Luxury leather goods label Troubadour does not disappoint when it comes to tech accessories, producing this sleek, minimalist laptop sleeve in smooth black leather. With a flap fold front and internal pockets for a laptop and documents, this is the ultimate pick up and go piece for the businessman about town. Available at troubadourgoods.com, priced £225. If you’re a Samsung fan, look no further than Montblanc’s new luxury range for the tech giant. Crafted from weaved carbon fibre, its Galaxy Note 4 case not only looks the part, but offers a 3D unlocking system and virtual Montblanc fountain pen, designed to emulate the feeling of the real deal. Available at Montblanc, priced £160. As the name suggests, this accessory is the perfect versatile piece for any technology lover. Unisex and uncomplicated in its form, this lightweight iPad Mini sleeve will keep your tablet protected in style, without adding to the weight of your load. We bet you’ll cherish this piece for years – or until the next iPad comes along. Available at mulberry.com, priced £125. This doesn’t look like your average laptop bag, which is why we’re adding it to our wish list. Forget the days of bulky, bland transporters and welcome in this more stylish option from Swedish label Sandqvist. With a utilitarian feel and luxurious leather accents, this contemporary take is not only useful, but looks the part too. Available at ASOS, priced at £169. Hailing from Horween in Chicago, Shinola works with one of the district’s longest-running tanneries to produce fine quality leather in a range of beautiful shades. We’re fans of this rich olive tone, which gives its iPad Mini holder a military feel. Along with your tablet, this case can also carry your documents, cards and a notebook. Available at Mr Porter, priced of £130. Japanese label Porter is renowned for its practical, stylish designs, with its small and simple camera case delivering on both fronts. Crafted from a lightweight nylon and dyed through a liquid coating process, this unassuming accessory is the perfectly understated piece to house your photographic equipment. Plus, at just £40, you won’t regret making the investment. If you’re not into leather goods, Parisian brand Côte & Ciel has a fabric solution that looks just as slick. With enough room for most tablets, this minimalist piece can be used for whatever you please – transporting your tech, carrying your wallet or just to keep your belongings protected on a rainy day. Plus, this soft silver shade will prove to be as versatile as the piece itself. Available at Present London, priced £30. Swedish brand Unit Portables serves us straightforward practicality, with its simple bags providing buildable storage solutions for all of your gadgets. Its Unit 20/03/ Laptop Bag comes complete with detachable pouches, pockets and a shoulder strap, depending on what you’re taking with you day to day. Normcore at its best. Available at unitportables.com, priced approximately £55 (€75). Wearable Luggage: The Best Chest Rigs And Holsters To Buy In 2019 They're here, and they're here to stay The Amalfi Coast Destinations Tourists Don't Know About Sure, you could take the same Amalfi Coast Instagram shots as everyone else. Or you could eschew the tourists and be a real travel insider... Blonde Ambition: How To Bleach Your Hair Who does the platinum look suit and how do you get it?